Who says that brain cells can't be grown? Mobile data traffic has increased the size of the world wide network by at least 100%. It was only natural that the established security providers have made the jump to mobilespace. Kaspersky follows the trend, bearing a large shield on your touch screen display. But despite the bravado it still has some way to go before becoming lean and mean. Still, let's see what Kaspersky Internet Security offers so far. At a first glance, Kaspersky doesn't offer much. But that is because it wants you to know what you will be left with once your 31 day trial period is over. 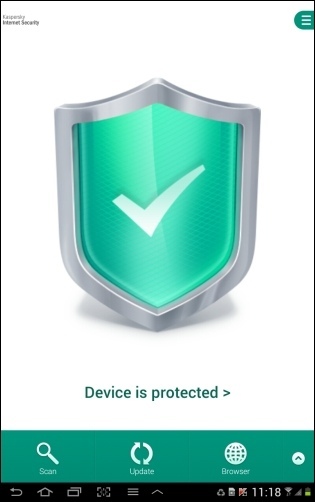 The most noticeable thing is that the team at Kaspersky want to assure you that you are protected by displaying a large shield with a check mark. The shield comes into action whenever you scan. Purging whatever was storing, it fills up with a minty green substance while the shield itself lights up like a fully operational baking oven. You can chose between three types of scans, one taking longer than the other. Scanning a particular folder seems interesting but it actually means scanning either the internal memory or the SD card. Scheduling is available with the subscription only. The scan time is relatively fast but Kaspersky's un-orthodoxy can be seen here. You will need to make a decision on every item found during the scan. This means you need keep an eye on it for the whole duration instead of just checking the end result. As an added weird behavior, skipping an item will make it pop-up later. Automatic updates follow the same rule, so if you're too cheap, you must manually check for updates every time you feel a disturbance. Privacy protection is a nice little feature that hides specific contacts from prying eyes at a flip of a switch. Unfortunately, accessing them through Kaspersky Internet Security itself is quite easy since the security code is seldom requested. The same issue goes for the Call & Text filter. You restrict the calls your kid's phone can make but then the kid can disable the restriction immediately after. Anti-theft. Right. Theoretically Kaspersky Internet Security can remotely lock your device, send location coordinates (Google Maps link), ring an alarm, do mug-shots and wipe data. The wipe can be restricted to contacts instead of a full system wipe but there is one big issue. Anti-theft either acts with a very long delay or it does not work at all. I like the fact that you can protect your sensitive information. But unfortunately there are hindrances to accomplish either hiding or deleting contacts. 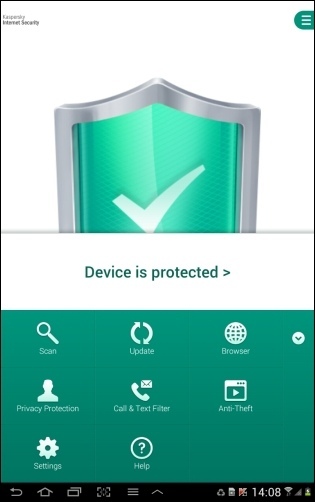 Kaspersky Internet Security for Android is a hit and miss busyness. On one hand, the company has made efforts to accommodate the index finger but the anti-theft lag, the security settings issue and the fact that the Settings menu is not intuitive enough might deter some users. But despite that, the virus scanner is quite the performer while the subscription price is relatively inexpensive. Still, you can judge for a month if it's worth it or not.